Building a log home...we hope. My wife and I are looking at some farmland in Oregon upon which we hope to build a log home. We're still in the looking stage but we've found some very promising possibilities. Will be updating as time and progress develops. Re: Building a log home...we hope. Do you plan on using native trees, or are you thinking about a "log package" from a supplier? We're still at the property acquisition stage but I'm leaning towards a hybrid of both. 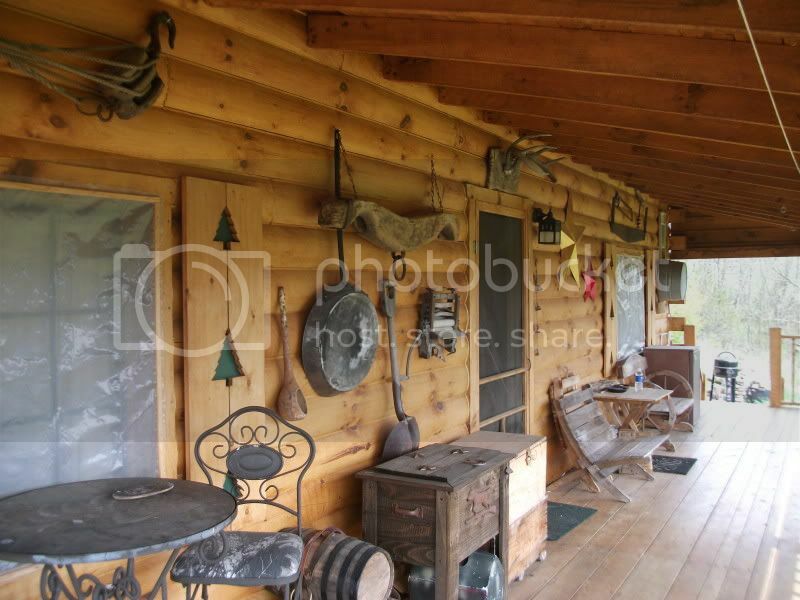 I've been consulting with a friend who's been building a pretty amazing log cabin for the last 10 years. He used a system whereby he designed and planned the building and then sought out quotes for a complete set of logs based on his plans from various log suppliers. The supplier he chose did the math and then shipped him the trimmed, debarked logs in bulk. He built the cabin and ended up with 1 or 2 logs leftover when all was said and done. That's pretty impressive to me. The complete "Kit" method is something we're also considering. There are some very distinct advantages to it but they come at a cost. 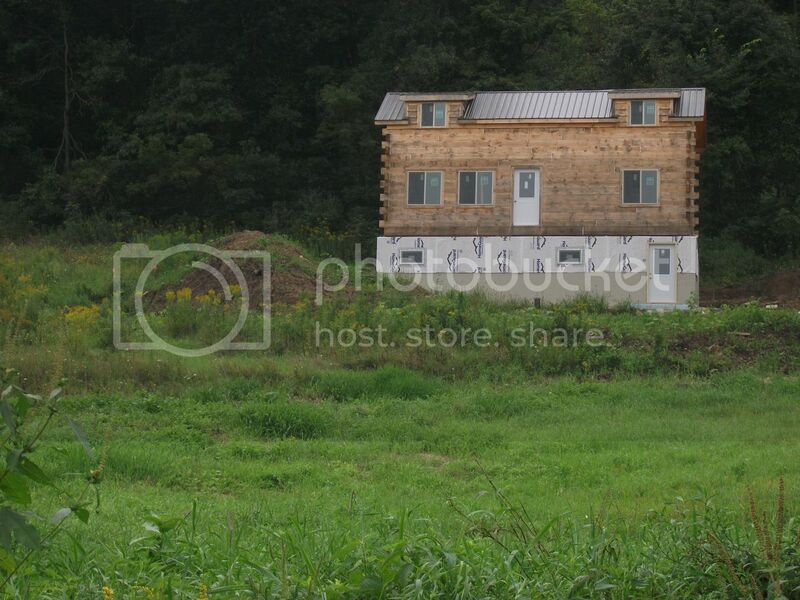 We bought a custom made Amish built "cabin".....not a house.....size being the difference. Need to have chinking checked and re-stain....this year. The first case is what I was referencing. Just a suggestion, but if you are looking for a supplier to pre-cut and ship logs to Oregon, check with the Canadians. I'd bet you a fifth of Crown Royal that a U.S. log supplier buys his logs from Canada, and resells them to you. You can't believe how many log trucks with house logs I see crossing the border every month in the Spring and Summer. Years ago, I remember seeing tons of those log kit-home builders around Kalispell and the Bitterroot valley......don't know the origin of the logs, but some of them got pretty palatial. We saw lots of big log homes that were for sale all over the mountain regions of western Montana last summer......people must be running out of money up there. Good luck, I hope you get it! If you do, please keep us updated with pics of the process. I would love to see it come together. Did a lot of research to arrive on the decision for our cabin. One company had a guy the had built several on his development......pa ckage deal....like 250k up...sg footage 900 sq ft up. Reason I looked is that the same company sold kits.....starting around 50K...up...for use on MY property. Good start is figuring .....double the cost of the kit....to put up and close in.....then another same amount to finish off any amenities..
Property and site prep is up to you as well. 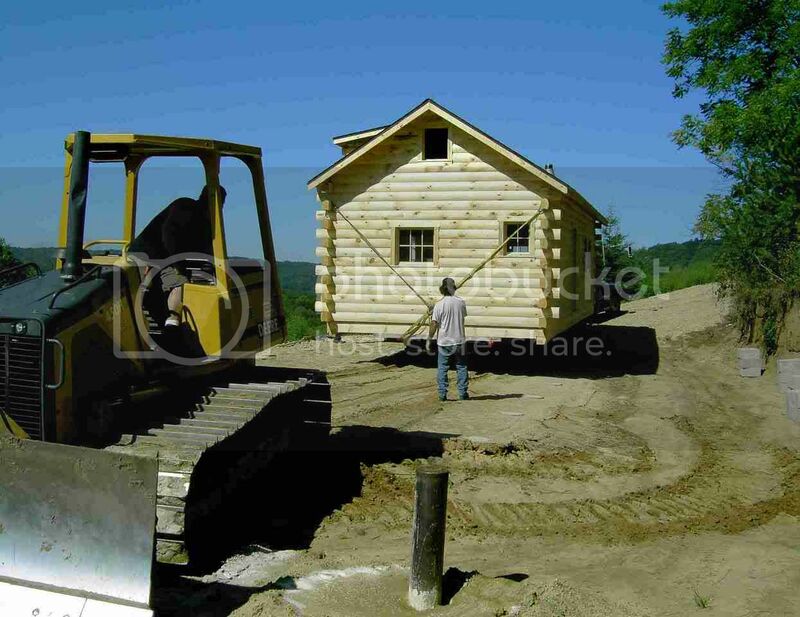 Our decision was a 16' X 40' closed in cabin, with 8' porch built wit 8" tongue and groove "D" shaped logs that were milled on their site. The site prep, excavation, well, septic/drain field that was done first. CHECK....access road, power, well depth if (possible), perk for septic...zoning and mineral rights. Most all can be worked with....just a lot more expensive. If you're talking 20+ years back, the logs might have been native. Logging restrictions are such now that the lumbermen are struggling just to make 2x4's, let alone house logs. We've have 2 local mills close in the past 15 years. Yes, there are many for sale up here. And good luck finding one, even on 5 acres, for under $400,000! That's why if you find one already standing, on acreage, it's going to carry a half-million $$$ price tag! If you're a retired airline pilot with a fat 401K, then c'mon up! It's gonna be interesting...I got my wife 5 different books about log home building for Christmas, her birthday present is already hiding in my workshop, it's a double bit axe. She's at least as excited about the potential house as I am. The land we've found has already had a lot of the necessary prep work done. It's been approved for a home, has a rough driveway cut out, been perc tested and tentatively approved for septic. Even has a creek running thru it. Oregon has some interesting zoning and other property usage issues that I'm learning more about as we progress. Let's hope this parcel doesn't carry any caveats that are going to sneak up on you. One family I know followed their "Montana Dream" and bought 5 acres north of town. After building their home, they found out they were limited to 5 chickens, and 1 rabbit. No horses, sheep, goats or pigs. Ignorance on their part, but a real crimp in their dream. It's been a real problem here with out-of-State developers buying up land and then imposing caveats inconsistent with local life styles. Yes, you have to review the title policy and copies of any and all covenants that have been placed on the ground. You also have to visit with the local governmental folks regarding ordinance restrictions on use. If you are using a Realtor make him do some of the work and get it in writing. Covenants on the ground can be restricting as all get out on your ability to use the ground in the ways you might want to. If there is a good side to covenants they will prevent some junk, shoddy structures, and too much stuff on too little land area from happening. We are far enough out that development won't occur in our lifetime but close to town there are some real nightmares. Covenants can be good things though. One subdivision of 3 to 5 acre lots with no covenants is near the small town we travel to frequently. 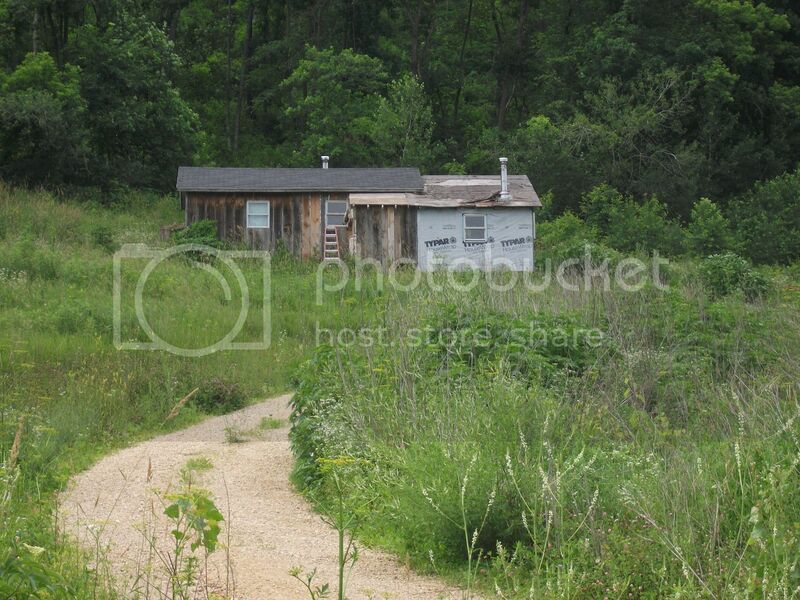 The variety and disparity of housing and outbuildings is incredible. One family builds a nice structure and it is a clean lot with nice fence and a couple of nice sheds. Next door is an old single-wide trailer just hauled in and put on blocks. Half resided with pine boards with the remaining half various stages of dilapidated metal pieces. A yard full of junk cars and other disabled machinery along with piles of old building materials. Horses graze on a two acre fenced in flat spot that has not seen a blade of grass in five years. This eyesore sits on the main entrance road to the subdivision and offers potential buyers of adjacent and nearby lots a view of what can and will happen. Sales have been slow. I've never bought a residence with resale value as a main motivation, but millions of folks do. Thanks for finding the term that escaped me, Stan: covenants. Without covenants, neighbors' only recourse is County and/or City governments regarding "nuisance" ordinances. BUT, covenants are very hard to enforce without the authority of a Home Owner's Association over-seeing the development. And once you get under the thumb of an HOA, you are going to be told how short to cut your grass, where to park you cars, and be subject to a multitude of ridiculous restrictions. Good points...."approved for a home"....may have limits on size.....and completion window of one year. Our lot had several Covenants .....from the developer. 800 sq. feet min....closed in with in a year....building need permit and inspection before occupancy. Our township min of 5 acres to BUILD on.....Township next door...30 acres. 50ft Easement along the river...for public use. Power company, no hook up unless the home is complete. Now there are creative options....This is where local contractors and a USDA Ag number comes in. Neighbor crops 12 acres so that qualifies me for the Ag number. Power isn't residential ....Ag seasonal rate for out buildings....shed.. .plug in trailers. Was able to do electrical and plumbing....get that inspected.....only requirement was a disconnect on power pole....Mobil home style. Can still have everything disconnected, porch removed and haul off. Power there and septic was perked, well drilled and state inspected before my Bigazz "shed".... cabin showed up. Do you know anyone that can do the work.? Sometimes this is worth spending some time and money.... buying brewski's or attending the local Veterans and church dinners. Who do you want for a neighbor.....LOL? Land was sold....guy that bought it....got rid of the yurt.... and built this? I believe that this is the best log cabin premanufactured home worth investing in. They build it before shipping to make sure everything is right. They assemble it on site. You have to do the finish work, joists/roof, windows, and wiring/plumbing. You will need to add those costs to the house total. I believe they own the land the logs come from. We didn't get one because the wife thought it would not blend in with our neighborhood. Wish I had though. This modular is crap. The question probably isn't directed at me, but my answer might surprise. #1 could be a retired couple, or younger couple with a desire to live in the country in a turn-key operation. The only "sweat equity" that interests them is planting a few fruit trees, and a tendency to bring their city comforts and attitudes with them. 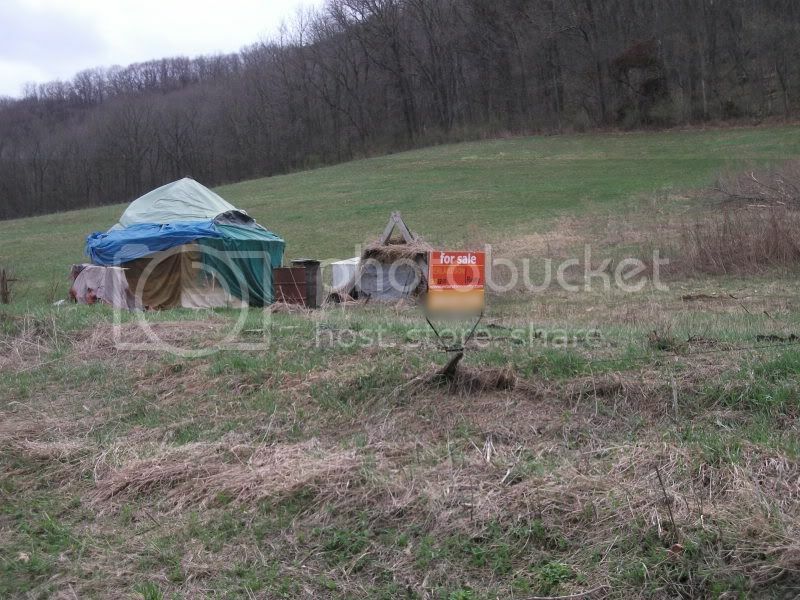 #2 appears to be "camping out" on his own property. Bought a few acres to get away from town, and do as he pleases without the hassle of "public lands" use. #3 would actually be my choice for a neighbor. Pay-as-you-build approach. Basic needs covered. Probably a whole lot less likely to complain about my crowing rooster, or my goat eating his noxious weed crop. This "shack" actually looks like a lot of folks here who build a livable dwelling while constructing a more permanent home on the property. I know several who spent 1 or 2 winters in small campers while building their log, or stick home, including milling their own lumber. I'll pick #3 for a neighbor. Thanks for the tip, I added them to the ever growing files of info. You are 100% correct on what HOA restrictions can be......... ridiculous. Nice modular, Hunter! And a good job "proving up" on it! Hunter that is a great cabin. You ought to take a bunch of photos on the inside too. Looks like a winner. Nice site too, great view you have there. Hunter, what is that your house is sitting on? I see the trees out back in your first pic. In the next to last photo, trees are in the same place, but there is a door down low- never seen anything like that. John, maybe all the B&B axemen can come up; hew and cut joints for you( you do the layout) of course everyone would have to head home before you got to rafters and purlins. Hope it works our for you anyway you get there. 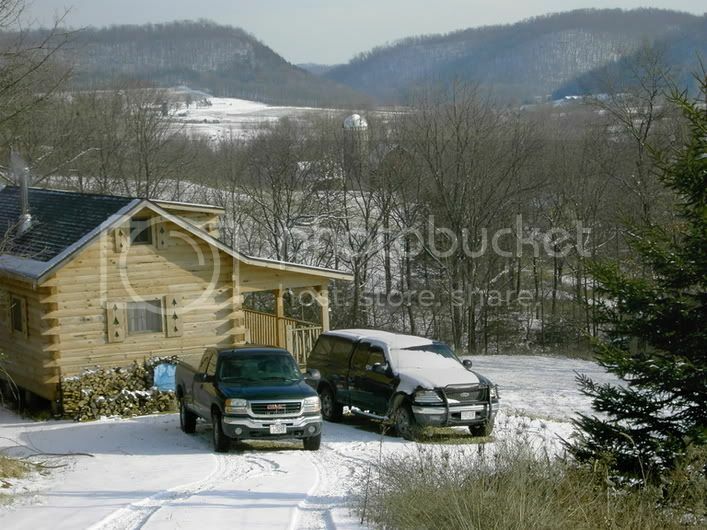 The last pic of the cabin on the hill and basement isn't mine...is a work in process on the same lot as the blue bus , yurt, and shack on the hill....... that was all removed.....and cabin like mine was set on a foundation. Yeah have some more pic's...but this isn't my thread...and I kinda feel I stepped on it a bit. Lots of stuff involved and have traveling the journey,... (1998 to present)... just wanted help out on those little details that help you get from here to there. 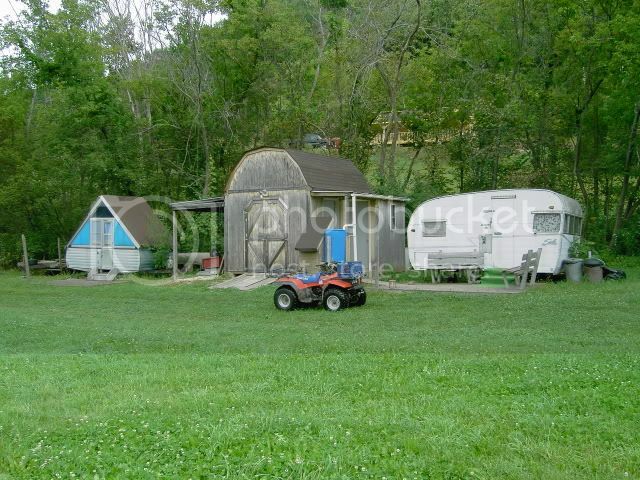 "The Place".....original with travel trailers, Taj-ma shed......in use from 1990 to 2004. You can see the new cabin up hill and behind the trailers. That explains why I couldn't reconcile the dormers either. I like your dormers, good to have on a simple gable. Where's your cabin located Hunter? It looks very nice from what you've shown so far. It's located on about 16 acres in south west Wisconsin....on the Kickapoo River. Bought 10-1/2 acres....then added 6 more. My west boundary is the township line...our township has a 5 acre limit....but the other township has a 30 acre minimum....neighbor got in with his cabin before the change.....Another one of those pesky details. Great porch. Guy could sit and spit off that all day long. 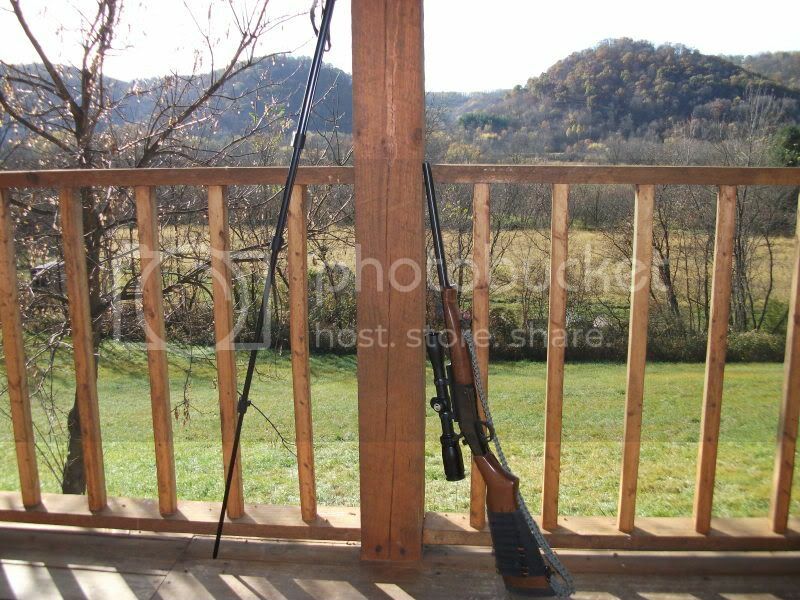 That's just one of the things I miss about living on the home place.....opening the front door and firing a few high-powers into the bluff. Relieved a lot of tension! I can't find the sign I inherited from my late best bud, but I see they are still available to remind guests of proper protocol. Wieners and porch decks go together like peas and carrots. Standing there at the edge, one day, taking a wizz....looking down at how tall the grass was,... around my spot. LOL! Someone wrote in a "natural remedies" book that pouring urine on weeds would kill them. Nobody told the weeds. Obviously one of these "tips" that gets read, and repeated without any practical experience. Urea is a time-tested fertilizer. But the diet and hormones of the host play a big role. From my experience, the urine of a female dog will kill vegetation in a heartbeat. But once the female is spade, it has no affect on grass/plants. Well, since you brought it up.............my spayed female seems to have no effect on vegetation, but my neutered male can kill all types of vegetation. If I could just take the little SOB around and squeeze him, I wouldn't need RoundUp. Once paid $4.95 for a quart of "K-Grow" fertilizer......Fro m K-Mart. Never worried about it sense. BTW Female dogs do kill grass.....wood ashes sprinkled on the spots helps. How did this go for log homes to dog pee..? I missed this post somehow. So you were one of "those neighbors" for 14 years yourself? Yes sir I/we are/were....but still here........cabin 12 years ago....and all paid for. 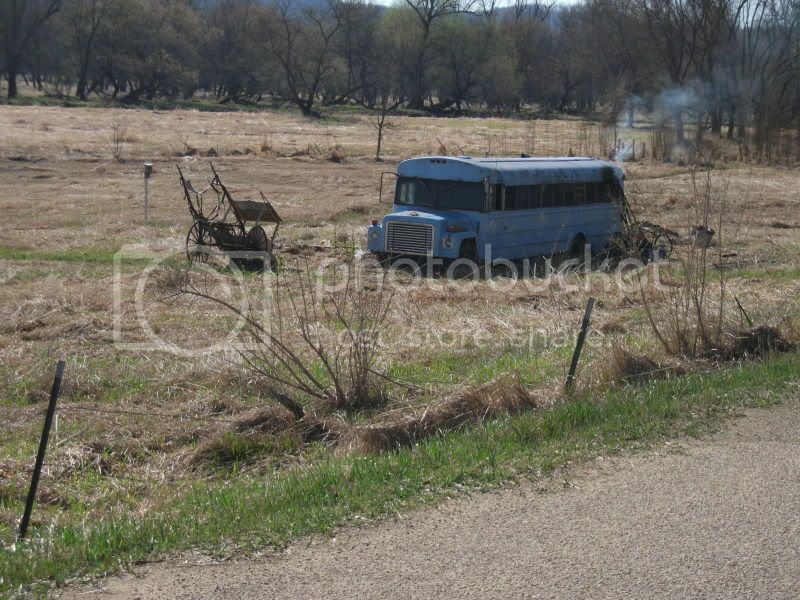 The bus/yurt guy was a squatter ....gone. Shack cabin guy, ...land contract...ran out of money.....I see this a lot. Retired last April....kinda waiting to see what his next step will be. Cabin to the east...just changed hands....guy paid about 30k for land and cabin ..12 years ago...sold for 90K no well, out house, no power.....seem OK.
First lady from Chicago...bought as an rental investment....Then rented to some a-wholes.....decided what's mine is his, and what his didn't belong to him anyway....lasted a year or so....Glad to see him go. Next family moved in.... repaired old farm...making the "homestead" gardens, chickens, couple of goats......no insurance...had medical problems and needed a new well......ran out of money...sold out in about 6 years. Next people moved from Alaska...she was kind of a PITA, but was a nurse. as was a adult kid. They made money with foster children....then he went to jail for molestation. I managed to buy the 6 acres next to me before her, actually with a phone call to the realtor ....so she didn't have both lots...and sold out. That lot has the Amish cabin that just sold.....we will see. People that bought the farm /homestead......He lives there and works from home doing interweb stuff. Talked to him while helping him pick tomatoes last fall...for canning......said he had a good year...ONLY cost him 250k last year... for expenses and remodeling...so far good neighbor. Point is: The Building doesn't matter all that much....the people do,....and owners are better neighbors than renters. Boy is that last sentence true. People do matter. At this time we have good neighbors on all sides. Wasn't always that way though. An acquaintance that lives near where we're hoping to buy went and scouted the potential property. He gave it a big thumbs down so we're back in the land scouting phase. The best of luck with your venture ,I envy you I have to say ,was building a holiday home here in Ireland and looking for planning permission for a log cabin . No luck the local council would not allow it ,say it was not in keeping with the locality ,what a load of old rot . After holidaying in the states and seeing all the fantastic log cabins I got the bug . So again the very best of luck,let us know how you are doing . Live everyday as if it's your last, because someday it will be. Was it the architectural style they objected to? We've given up on Oregon. Trying for New Mexico instead. Heading back there in a few days hoping to buy a nice, undeveloped 30 acre lot south of Santa Fe.